Standing in place for the injured Aaron Rodgers, Green Bay Packers quarterback Brett Hundley connected with Davante Adams for a 19-yard touchdown for what would be the game-clinching score against the Chicago Bears. Following the Adams score, Bears quarterback Mitchell Trubisky attempted to claw his way back from a 10-point deficit with just over five minutes left in regulation. However, the rookie signal caller fell short of the mark, leading to a 23-16 loss for Chicago. Trubisky held his own against the Packers’ defense for a majority of the contest, completing 21-of-35 passes for 297 yards, 46 of which coming on a deep touchdown pass to Josh Bellamy. The same couldn’t be said for Bears star running back Jordan Howard, as the second-year standout totaled just 54 yards on 15 carries (3.6 YPC). Conversely, Packers running backs Ty Montgomery and rookie Jamaal Williams combined for 121 yards on 26 carries. With that, we give you our PFF exclusive takeaways from the contest for each team. The Packers coaching staff have never been afraid to open up the offense for their young quarterbacks. That confidence has undoubtedly been of benefit to Hundley, who recorded the best game of his young career. Facing a key game situation, on his own side of the field up a touchdown with four minutes to go, Hundley launched a beautiful arc down the right sideline to Davante Adams. Although he still needs a ton of development on his footwork in the pocket, Hundley certainly has the arm talent to succeed in the NFL. He has a 110.0 passer rating under pressure in this game. Rookie running back Jamaal Williams has had to be patient this season, but he seized his opportunity with easily a season-high 35 snaps against a stout Bears front. Although his traditional stats underwhelm (20 carries for 67 yards), he battled hard on the ground all day. Williams earned 55 of his yards after contact, breaking seven tackles. Two came on one impressive play where he showed good vision to cut away from the clogged point of attack, slipping by the end and finally ran over the corner for a first down conversion. Daniels was a force on Sunday, finishing with grades north of 80.0 in both run defense and as a pass-rusher. Daniels recorded four pressures (three hurries and a sack) on 29 pass-rush attempts to go with five total stops. Three of his stops came on 12 snaps in run defense, giving him a 25.0 run-stop percentage, which led all interior defenders through the early games. Paired with Daniels, the Packers defensive interior wreaked havoc on the Bears offensive line for much of the afternoon. Clark led Green Bay’s defense with an 85.3 run-defense grade and he also tied his season high with three pressures (all hurries) as a pass-rusher. Clark has really taken his game to an extra level since Week 5 and as of this moment he ranks 12th among interior defenders for the season – two spots ahead of Mike Daniels – with an 88.2 overall grade. Trubisky was at his best when the Packers brought an extra pass-rusher, completing 10 of 14 throws for 157 yards and a touchdown (which was a beautiful deep ball down the left sideline) on throws coming against the blitz, good for a 132.1 passer rating. Trubisky once again though struggled connecting on throws when he was under pressure, he completed just three of nine attempts for 38 yards and he now has a 32.0 passer rating under pressure for the season. If all of his throws under pressure had simply landed incomplete his rating would be 39.6. Making his Bears debut, the former Charger receiver was on the field for 57 out of 60 snaps and Trubisky had a 110.4 passer rating on eight targets to Inman. Five of Inman’s catches resulted in a Bears first down and he caught targets while matched up against four different Packers defenders in Week 10, including three catches when covered by Davon House. Hicks has found a home in Chicago, and the scheme-familiarity is bringing out the best in him. Jahri Evans endured a torrid afternoon trying to block him, giving up six stops to the dominant defensive end. Hicks added two hits and two hurries as a pass-rusher, earning the game’s best grade. At the other end of the spectrum, Fuller has yet to up to his status as a first-round pick. He has now missed 35 of a possible 196 tackles in his NFL career. As well as his issues against the run, Fuller allowed eight of ten targets to be complete for 127 yards, though he did add two pass deflections. 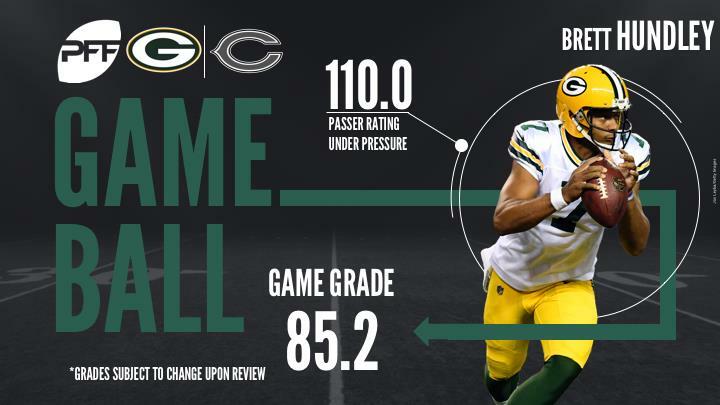 He started the game well, almost intercepting Hundley on the Packers’ first offensive drive, yet his confidence seemed to ebb away once he’d made his first mistake. Corner remains an issue for the Bears.